New York, NY – New data calls into question how transplant recipients will be able to pay for a lifetime of anti-rejection medications, according to the National Kidney Foundation (NKF). Research from NKF on drug coverage in 2015 healthcare exchange plans found that plans are charging high cost-sharing for immunosuppressive medications, requiring patients to pay an average of 36 percent of the cost for transplant medications. The data analysis was conducted by Avalere. These higher rates are an indication that healthcare exchange plans are shifting immunosuppressive drug costs to patients. These medications are necessary for patients to prevent transplant rejection. At the same time, recent data (.ppt) shared during last month’s Organ Procurement and Transplant Network (OPTN) Advisory Committee meeting shows an increase in transplants among younger adults from December 2014 to June 2015. Medicare coverage for transplant patients expires 36 months post-transplant. The Affordable Care Act (ACA) has offered broad access to insurance, giving transplant recipients who are under age 65 and not disabled better options to gain insurance coverage after Medicare ends. However, patient cost-sharing for immunosuppressive drugs can be so high on the individual exchange plans that patients have difficulty paying for their medications. While most silver exchange plans use flat copayments for generic immunosuppressive medication, for any given drug 19-32% of exchange plans are using coinsurance. The average amount of patient coinsurance across generic and brand immunosuppressive drugs is 36% with three plans requiring coinsurance for immunosuppressive drugs up to 60%. The use of coinsurance typically results in patients paying more for their drugs. There is also a lack of transparency for the dollar amount they will have to pay to fill their prescriptions. 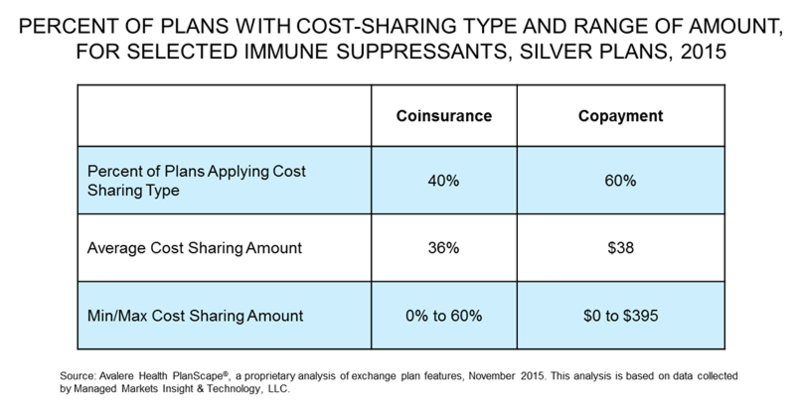 When coinsurance is used, the average patient cost-sharing across all silver exchange plans is 36% of immunosuppressive medications. The portion patients are being required to pay can easily meet the annual out-of-pocket maximum which, in 2015, was $6,600 for patients not receiving a cost-sharing subsidy. In 2016, plans will be barred from placing nearly all immunosuppressive drugs on the highest cost-sharing tier after a rule was made by the U.S. Department of Health and Human Services. However, this action may not stop the trend of greater use of coinsurance and higher copayments for organ recipients and others who rely on medications to treat chronic conditions. Avalere Health PlanScape®, a proprietary analysis of exchange plan features. This analysis is based on data collected by Managed Markets Insight & Technology, LLC.